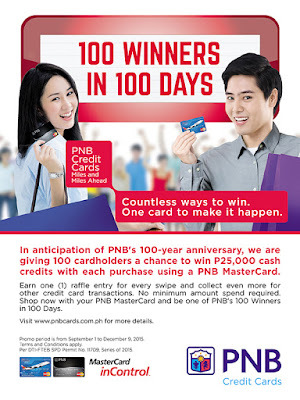 PNB 100 Winners in 100 Days ~ Philippine Freebies, Promos, Contests and MORE! In celebration of PNB's 100-year anniversary, they are generously giving away 100 very lucky PNB MasterCard holders a chance to win P25,000 cash credits in PNB 100 Winners in 100 Days promo. For each transaction made using your card, you will be entitled to a raffle entry. What's great about this is there's no minimum amount spend requirement. Plus, you can earn additional one (1) raffle entry when you make Cash Advance or ABF transaction. On the other hand, five (5) additional entries will be given to those who will do Balance Transfer, Transaction Conversion or Convert-To-Cash transactions. You may win only once in the entire promo period. Join now and win huge cash credits which you can use in your future shopping.